Let's get caught up with the summer selection of coolattas shall we? 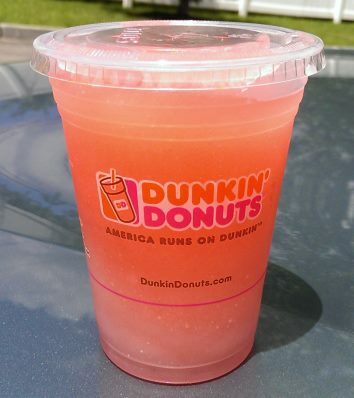 Rather then bringing back any of last year's coolattas, Dunkin Donuts has chosen instead to bring back a few older choices instead. Oreo returns from 2012, Watermelon returns from 2009/2010 and the Arnold Palmer appears to just be a rename of the frozen ice tea lemonade coolatta from a few years back. Ok, we tried the watermelon coolatta first, and by we, I mean I drank about 20% of it and my wife finished it for me. I totally expected this to be terrible but it wasn't really that bad. I expected an artificial blast but this one is quite tame. It doesn't excite me enough for a repurchase, but I don't regret it either (though maybe I would feel more strongly if I had to finish the whole thing myself). If you think the strawberry coolatta is a bit much, maybe a half and half with the watermelon would be interesting. After remembering that I never got around to trying any of the ice tea coolattas last time around, I decided to try the Arnold Palmer coolatta with my lunch on Wednesday (what can I say, it was a gorgeous day for a walk and this was my reward). Overall, I like it because sweet tea translates well to coolatta form, and when I say sweet, I mean SWEET. Picture the sweetest tea you've had and you'll know what I'm talking about. 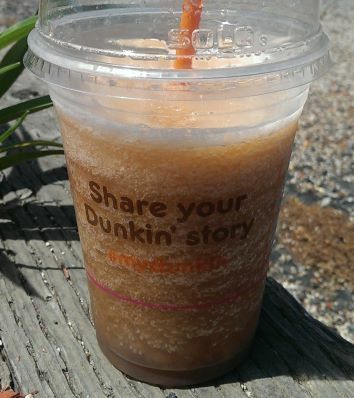 That's not a complaint, instead, it's what I expect from a coolatta. The lemonade portion? Well, it's more like a sweet sugary ice tea start with a lingering lemonade finish. I definitely expected more leomande bite, but considering that I had to explain what I wanted three times, I wouldn't underestimate the possibility that this was made with the wrong proportions of flavoring. Still, it wasn't bad at all, and I'll probably try it again. If you dont mind the sweetness or just an overall strong amount of flavor, give this a try.